Corporate Golf, Golf Practice, Any Golf! The Thornleigh golf driving range facilities includes 56 floodlit hitting bays over 2 levels. 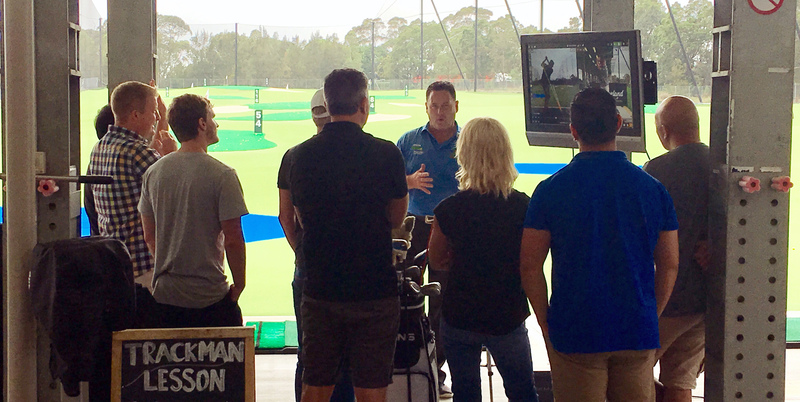 20 of the hitting bays on the ground level are equipped with full auto tee-up technology from Range Servant. All the driving range bays are fully covered ensuring that you can get your golf practice in regardless of the weather. There is a large 78 bay car park immediately adjacent to the clubhouse. Perfect for a Corporate Golf Day! The golf driving ranges‘s landing areas are synthetically turfed ensuring the quality of our range balls is always high. Full contouring and raised greens surrounded by simulated bunkers and water provides realistic shot set ups. There are 8 target greens in total. The green locations have been designed to ensure you can work your way through your whole bag with a green to aim at. Golf Lessons are provided by our team of qualified PGA professionals who are available seven days a week. There are a wide range of lesson options for all standards of golfers from clinics for kids just learning to private lessons for the most seasoned golfer looking to refine a part of their game. Our mid week ladies golf clinics, school holiday golf clinics and other golf for kids activities and mixed beginners golf clinics are also proving popular and are a great way to meet other people looking to get into the game of golf. If your interested in booking into a clinic then give us a call or book online now. The Bunker Café is open seven days and offers a range of snacks, light meals and drinks. Foxtel and free wi-fi ensure you can relax in comfort, stay in touch with friends, or get some work done before or after your practice. Our Golf Shop is fully stocked carrying the latest golfing equipment including gloves, balls, caps, clothing, golf shoes, clubs, bags and other golfing accessories. Our golf driving range is the ideal location to demo all the latest clubs and have your new set of clubs professionally fitted by one of our golf professionals. Our Mini Golf facility comprises 2 eighteen hole courses – Palms and Billabong. Thornleigh Mini Golf is Sydney’s best mini golf facility and an ideal venue for people of all ages and skill levels to have a great time.